Different wasp species have different sizes of colonies, but a large wasp colony can contain up to two or three-thousand worker wasps. If the conditions are right, the queen will continue to lay eggs and expand her colony throughout the summer. The trouble really begins in August and September when the larvae hatch and the nests are disbanded. The next generation of hungry wasps is let loose from the nest but they also have the competition of the older generation who can no longer feed on the sweet larvae secretions. The next generation consists of both queens and males who have nothing to occupy their time as there are no longer any larvae to care for. That is when they start to cause problems. The best thing to do if a wasp is bothering you is to keep still and stay calm. Most people are worried about a wasp's sting, especially those who are allergic to them. 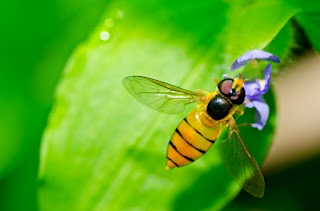 Unlike bees, who will die after stinging you, wasps can sting you several times with no adverse effects upon themselves. The venom from the sting causes either pain or paralysis depending on the victims' size. Smaller victims are carried back to the nest for consumption, larger ones are warded off. Wasps do not only plague humans. While wasps feed on insects, bees prefer pollen, so the two do not often associate with one another. During this busy, end of summer period, bee-keepers angrily report of wasps stealing honey from their bees. Even though they usually eat insects, wasps love honey and go crazy for it in summer. Although the bees try to protect their honey, they are often killed by the invading wasps. This can sometimes extend to the death of an entire colony. We tend not to be aware of the fact that wasps play a key role in the natural food chain. They are effectively nature's very own pest control. Despite common perceptions, they are actually a gardener's ally. If you were to find caterpillars had invaded your vegetable garden, so would a wasp, and then that wasp would eat all of those caterpillars. Contrarily, a wasp nest in the garden can cause serious issues. You should call a professional to remove a nest which is in a shed or a children's play area. If the nest you find happens to be in an attic and you can see where the wasps are gaining access from outside, you might want to wait until winter and then remove it safely. By then, the males will have died and the queen, fertilised eggs in tow, will have found another place to hibernate. Even though a colony can produce many thousands of queens, most will die of natural causes in the winter. Hollow trees or bird boxes, which are nice and dry, make ideal nesting sites but these are by no means abundant. Although wasp numbers fluctuate every year, they will not dramatically increase because appropriate nesting places are simply too difficult to find.